I recommend showing your child this post so they can understand what you’re looking for in the photo! I find it’s much easier to get cooperative kids if they know what is expected of them. Choose a shooting location with even lighting such as shade, or pick an overcast day. We used the shade created by our back fence. DSLR Camera users: get your settings ready before you call your kid over! You want a low f-stop (which is a wide aperture) – meaning the lowest your f-number will go. This gives you the most depth of field. Balance it out with appropriate shutter speed and ISO settings. Phone users: tap to focus, and adjust your exposure up slightly. 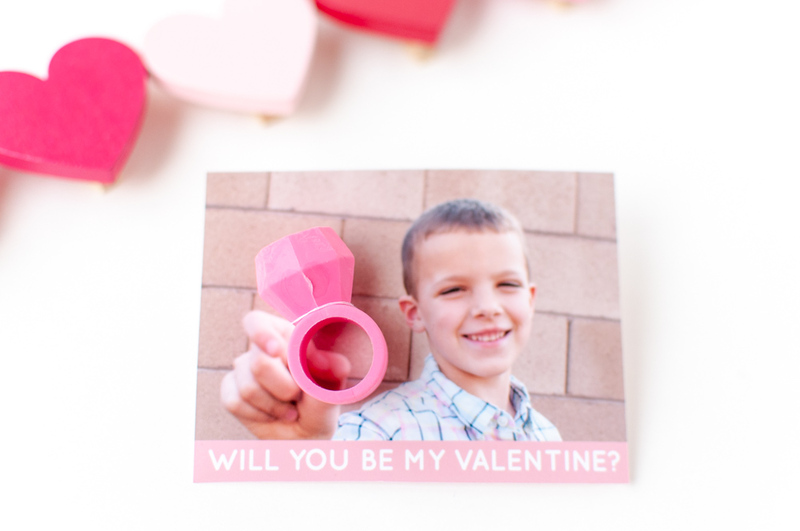 Landscape orientation works best for this type of photo – this gives you plenty of room for the ring AND your cute child on the valentine. Pose your child appropriately. You want them to hold their hand in front of them but to the side, not directly in front of their face. Ask them to pretend they’re holding an invisible ring to get their hand open slightly (look at the photo below to see what the photo looks like before you attach the ring). Focus on their face for the sharpest photo! It’s ok if their hand goes a bit blurry (and it helps the 3D effect). Shoot several frames so you have different options – you might be surprised which smiles you like or which position of your child’s hand is best! Choose your favorite image, and send it to a photo printer! I recommend Costco as the perfect mix of convenience/cost/quality for projects like this. 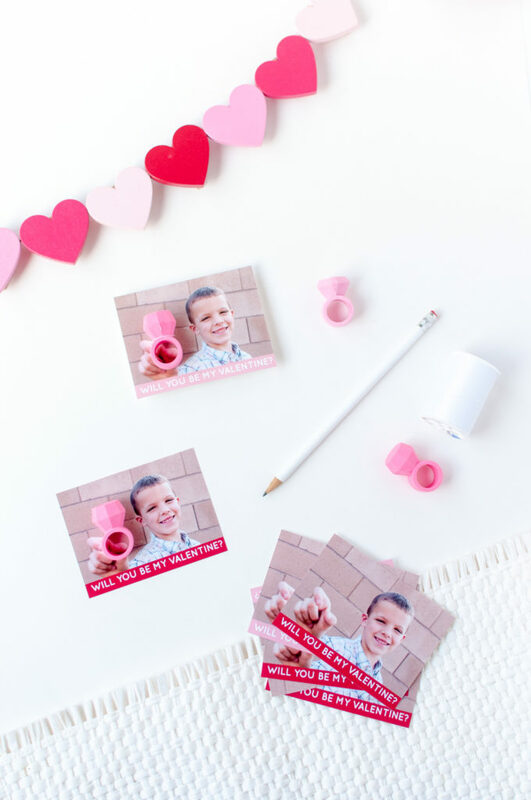 You can also add a caption like “You’re a Gem!” or “Put A Ring On It” or just “Will You Be My Valentine?” You could also have your child write that message on the back of each valentine for writing practice. At this point, I sometimes do a test print at home to make sure the sizing works the way I expected with the rings. You’ll need editing software for this (Photoshop, PicMonkey, Canva, etc), so it’s definitely an optional step, but it’s also cheaper for you to print only half the quantity. I got my ring erasers at Target Dollar Spot a few years ago, but they don’t carry the same things every year. They were a pack of 12 for $3.00. 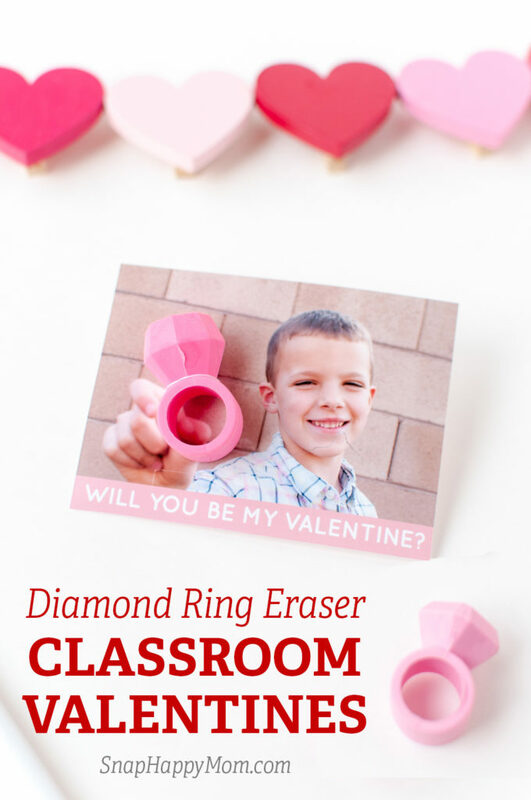 Party City is probably your cheapest source for diamond ring erasers, and the most reliable that they’ll be in stock too! I also saw some at Oriental Trading if you have time to wait for shipping. 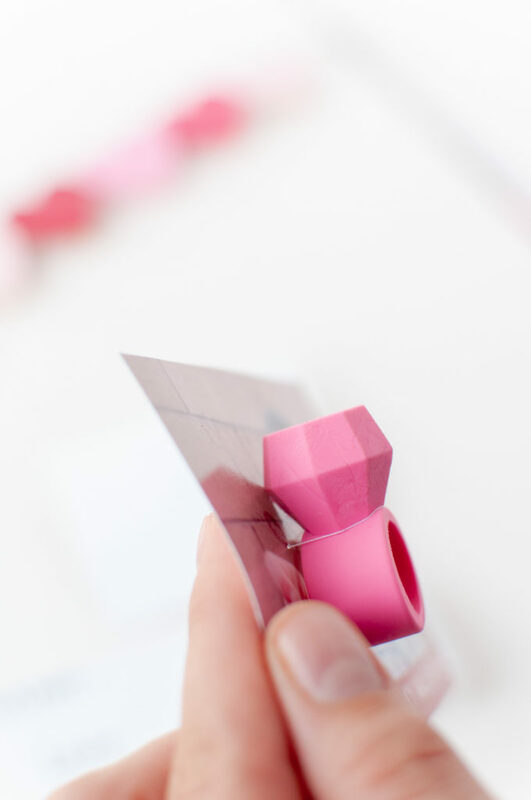 There are occasionally eraser rings on Amazon, but they are totally hit or miss on price/quantity. You’ll have to price check and see what is available. I’ve also considered other kinds of ring favors, like these owl rings, unicorn rings, or puzzle rings. There are also plenty of fake gemstone rings that kids would probably love – I liked these rings and these rings. Once you have your rings and your photos, you’re ready to assemble! Grab some scissors, a needle, and thread. If you need to cut your cards in half, that’s a great job for your kiddos. 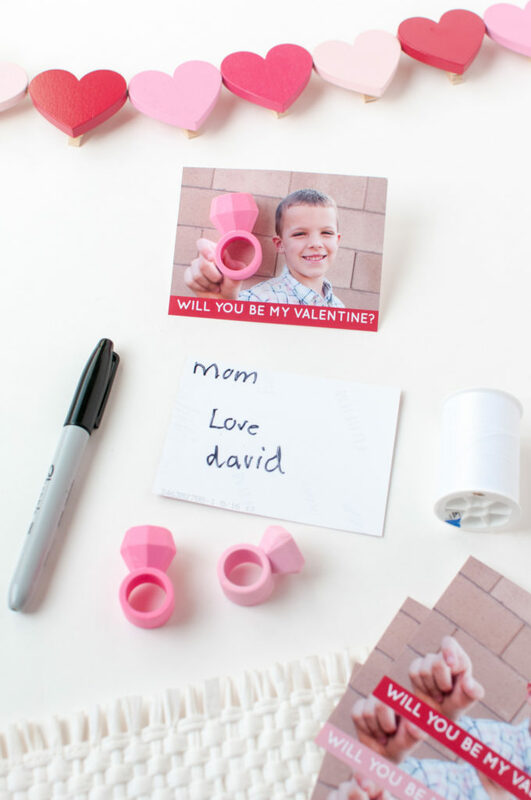 If you want them to write names or a message, it’s also easier to do that before you attach your erasers, so just do a little assembly line. To attach the ring to the photo, I just used a needle and thread to tack the ring where I wanted it. Nothing complicated – just poke the needle through from the back side and leave a tail. Come up and over the ring, right under the lip of the gemstone, then punch back down through the photo. Tie off your tails in a taut square knot on the back, to prevent the ring from flopping around. Overall, it probably took me 60-90 seconds per valentine to “sew” the rings in place, so it’s definitely doable. You’ll get much faster after the first couple times. You’re all done! 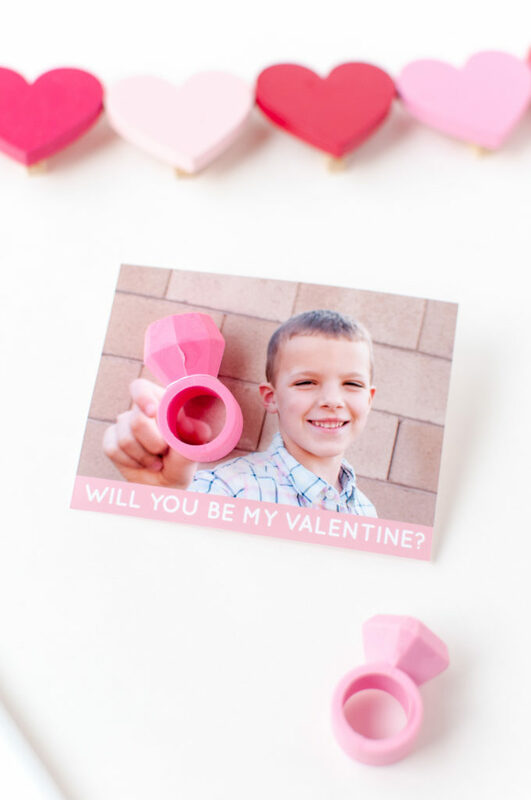 You have a unique class valentine, and hopefully had some fun with your child doing a creative project as well.